G's Crafts n' Things: Knitted decreases... how do they work? Knitted decreases... how do they work? This description is directed at mirror knitters and the mirrored version of decreases. Mirror knitters swap the meanings for the decreases we use because we approach the stitches from the other direction. I am posting this here. I have shared this on a board on Ravelry and thought i would add it here for refrence. Below is a swatch I made showing various decreases with explanations of how/why they work. This description is of the decreases from the top section down. These descriptions refer to stitches mounted so that the leading leg is in front. Due to your personal style of knitting the stitches on the needles may not be mounted leading leg in front and require extra slipping for correct placement to avoid twisting your finished stitches. 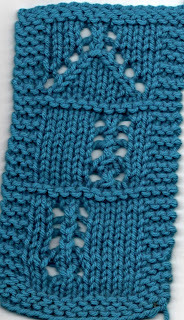 I am a combined knitter so I have to manipulate stitches a bit more than some. Patterns are written assuming you have your leading leg in front so that is what based these descriptions on. at the top where they join is s1 k2tog psso (you can see both lines of decrease end at this point and the point sits on top and the center stitch under sort of disappears into the point. the last decrease directly on top is a sl2tog k1 psso you can see the center line stays on top and the side stitches end into and behind it. these are all s1 k2tog psso - when stacked this creates a choppy line because the side stitches are being pulled over the center stitch and covering it. sl2tog k1 psso - you can see the center line stays on top and the stitches that are being reduced are “disappearing” behind the center line. this stitch is not used nearly as much as the s1 k2tog psso decrease. *you can click to enlarge the image for a better view. 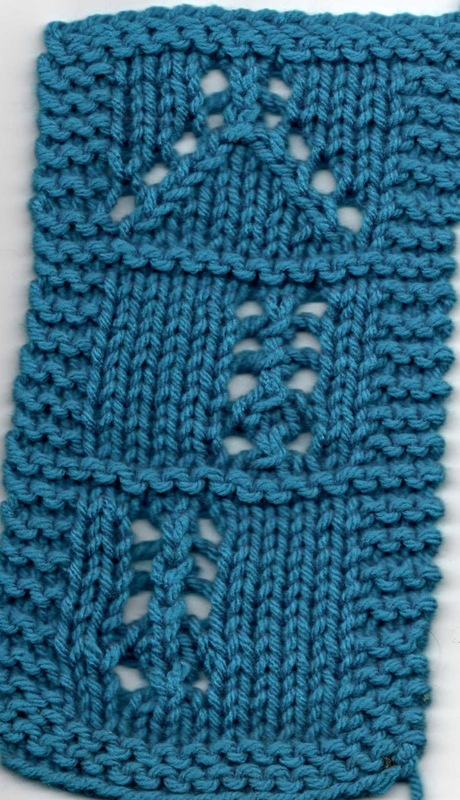 when working decreases on the wrong side that will be seen on the knit side you need to switch decreases to get the desired result on the right side of the fabric. To demonstrate why this is, take a small piece of paper and make a diagonal line from the lower left to the upper right corner, this line represents a right leaning decrease. When you turn the paper over that line is now left leaning. If you are decreasing in a field of purls and the purl side is the right side it doesn’t matter which decrease you use because lean cannot be seen on the purl side. use whichever one is easier for you.